Canadian MoneySaver is an acclaimed investment advisory with a recognized reputation for providing a trustworthy and down-to-earth service since 1981. Available nationally in print and online versions. *Online version gets you full access to 14 years of magazine and article archives, as well as special 'online only' articles. Article: Is It time to Add some Income Stocks? Click Here to Download your FREE digital copy. The March/April 2019 edition of Canadian MoneySaver has been mailed. 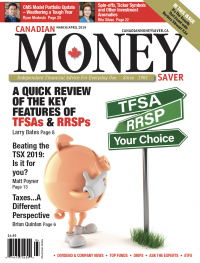 The March/April 2019 edition of Canadian MoneySaver is now available for online Members. Click directly on the Current Issue button once you have logged in (Online Members), or look under the "Issues" in the Subscribers Tab above. If you are not a Member, you can join by clicking this link. 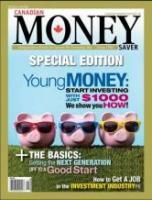 Canadian MoneySaver still prints Magazines! In October, an interesting development occurred in the publishing space. Rogers Communications, publisher of MoneySense and dozens of other titles, decided to stop printing it and numerous other magazines. Sure, maybe it is a sign of the times, as the whole world goes digital. But, we think, it is also a bad move. There are a lot of customers who still like printed copies of magazines. Maybe they’re older, but their money is just as good as a young customer’s. Maybe they just prefer printed copies, like many do. Here at MoneySaver, we have no plans to stop printing. If you want a printed version of your magazine mailed to your house, you can still get one. We have no intention of stopping as long as we have dedicated readers. get extra months added to your subscription if you refer a new customer to us. Congrats to CMS author Keith Richards and his crew winnng the Canadian Business Excellence Award!